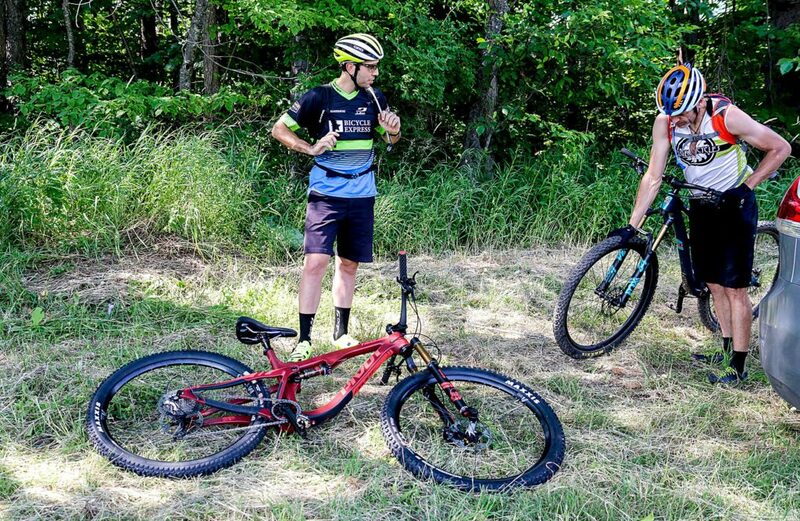 David Crothers, of Waterbury, Vt., and Tyler Merritt, of Richmond, Vt., get ready for a mountain bike ride up Ascutney Mountain from the Base Lodge, in Brownsville, Vt., on Monday, July 2, 2018. (Valley News - August Frank) Copyright Valley News. May not be reprinted or used online without permission. Send requests to permission@vnews.com. 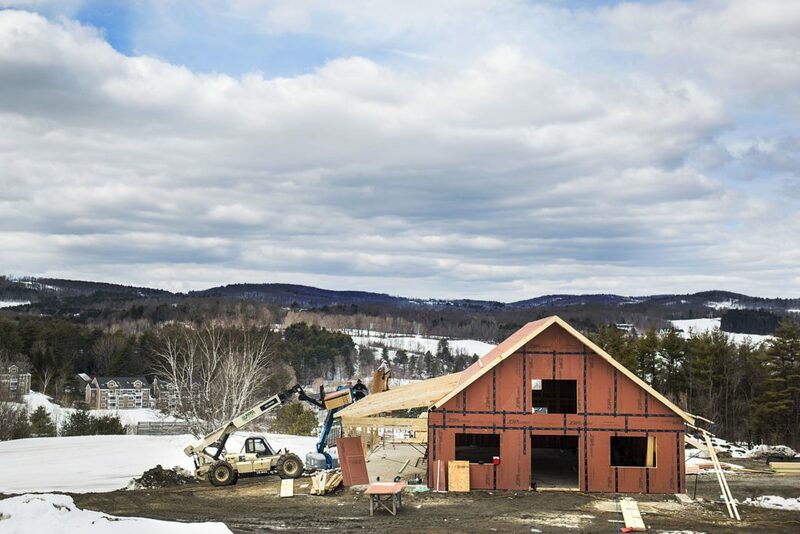 A construction crew works to finish the structure of a building on the foundation of the base lodge of the former Ascutney Mountain Resort in West Windsor, Vt., on March 23, 2018. Ascutney Outdoors member Glenn Seward said the project aims to be completed by the end of July 2018. "This has been a big part of the community," Seward said. "To see it continue on is very exciting." (Valley News - Carly Geraci) Copyright Valley News. May not be reprinted or used online without permission. Send requests to permission@vnews.com. 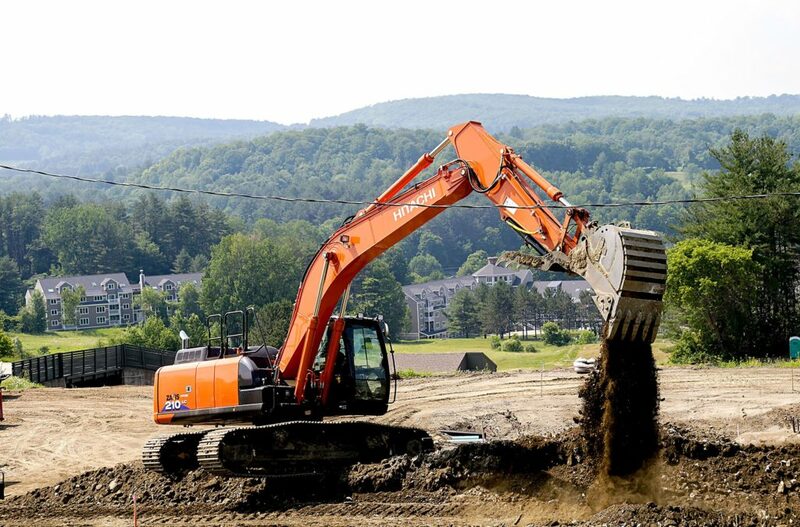 Glenn Seward operates an excavator as he builds new paths at the Ascutney mountain Base Lodge, in Brownsville, Vt., on Monday, July 2, 2018. (Valley News - August Frank) Copyright Valley News. May not be reprinted or used online without permission. Send requests to permission@vnews.com. Brownsville — With the Ascutney Outdoor Center under construction, a new tubing hill and lift set to open this winter and plans underway for the installation of a T-bar to service about nine ski trails, West Windsor is poised to step out from the shadows of the bleak and uncertain future it faced eight years ago when the Ascutney Mountain Resort ski area closed. Standing outside the center on a warm spring morning, Steve Crihfield, chairman of development and fundraising for Ascutney Outdoors, the nonprofit that manages the former ski area the town bought in 2015, says with a quiet confidence that the change at the former resort will not only bring back winter recreational opportunities but also help to revitalize the area economy — in particular, the real estate market, which took a big hit when the resort closed. The outdoor center is the centerpiece of the small, community-oriented recreational area that has emerged from the ruins of the former Ascutney Mountain Resort, which shut down in 2010 amid financial problems. Constructed on the foundation of the former lodge that was destroyed in a 2015 fire, the north-facing outdoor deck invites weary mountain bikers and others to relax with friends and a cold drink, while a room off the deck with high ceilings and large windows offers a place to warm up after skiing or perhaps hear an educational talk. Downstairs, a small bike shop will rent space for repairs and rentals, and there will be equipment available to serve food cooked off-site for catered events, which could include weddings, musical performances and private parties. “We really tried to design it a little like Goldilocks: Not too big, not too small — just right,” Crihfield said. Just below the center is the tubing hill, and above it are the trails that will be serviced by the T-bar and will bring skiers and snowboarders down to the outdoor center. A ski tow rope just north of the center has been operating since 2016. The winter offerings complement a network of trails suitable for hiking, running, mountain biking, horseback riding and more that run through the ski area and abut the town forest — a combined total of about 1,800 acres. As plans have come into focus the last few months, Crihfield said the group has taken a conservative approach so as not to overextend the largely volunteer organization with limited financial resources. There will be small fees for tubing and skiing from the T-bar but there are no plans for snowmaking because it would translate into additional operational costs. Ascutney Outdoors does have a trail groomer. The scene that Crihfield was describing that spring morning was unimaginable eight years ago, when the financially troubled Ascutney Mountain Resort, a vital piece of the area economy, did not open for the winter of 2010-11. A few years later, after resort owner MFW Associates was unable to find a buyer interested in investing millions to reopen the ski area, it sold off the remaining chairlifts, seemingly marking the end of nearly 70 years of skiing on Mt. Ascutney. Added to this discouraging picture was a sharp decline in property values on the mountain. Between 2010 and 2013, condos on the mountain lost, on average, 45 percent of their value and single-family homes lost 12 percent of their value, combining for a total decline of nearly $13 million in the town’s grand list, or about $50,000 in property tax revenue, according to the West Windsor Selectboard. To make matters worse, the water and sewer systems serving mountain properties were in desperate need of upgrades. West Windsor had been hit hard and though it hoped for a new owner to reopen the ski area, it also began thinking about alternatives as prospects for the ski resort’s future began to dim. The proposal to purchase the resort’s 470 acres focused on recreation — in particular a 30-mile network of trails, about half of which are on the ski property. After the last of the lifts had been sold, in May 2014, the Selectboard told residents in several mailings that town purchase of the former resort would keep those trails open to the public. Having 1,800 acres of conserved land on the mountain’s northwest slopes would make it “mighty attractive to outdoor enthusiasts from all over New England,” the Selectboard told residents. In fall 2014, with a special Town Meeting vote on buying the property approaching, the Selectboard laid out its vision. “The acquisition of the property could allow for eventual re-establishment of a small non-commercial ski area if there is sufficient interest among skiers, community members and investors,” the Selectboard said. Residents overwhelmingly supported the concept, and in October 2014, they voted in favor of the plan to buy the 470 acres, which included the access road to the property and the troubled water system. The town later would buy the sewer system, which it upgraded and extended into the village. Since voters approved the purchase, completed in 2015, and the town began to remake itself as a four-season recreation destination, the real estate market for mountain properties, where there are about 100 condominiums and a number of private homes, has reversed its decline. “Before, they literally were not selling at all, but they are selling now,” Dana Waters of Dark Horse Realty in Reading, Vt., said when asked about mountainside homes and condominiums. Though sale prices do not always match what many properties were purchased for prior to the resort’s closing, Waters said, demand is stronger. As an example, Waters said he listed one property recently on a Sunday and it was under contract by noon the next day with a backup buyer. It sold for the listing price. Waters credits much of the turnaround to the West Windsor Selectboard’s decision to purchase the ski resort, along with an access road and the resort’s troubled water system. Waters said he sold a home to an avid bicyclist who works for Harpoon Brewery in Boston. The buyer was interested in property in West Windsor because of the mountain biking opportunities. Seward agreed with Waters’ assessment. Before the vote to buy the ski area, the Selectboard told residents that ownership would help boost property values. “Clearly, having a popular recreational facility in town keeps property values up and tax rates down, which benefits all of us,” the board said. With the Trust for Public Land, a nonprofit that works to protect and conserve open space, taking the lead role, about $900,000 was raised over the next 14 months and the land purchase was completed in December 2015 with a permanent conservation easement placed on the property. It was a moment for celebration, but there were other hurdles to clear, first and foremost the old ski lodge. On a bitter cold morning in January 2015, a fire destroyed the vacant lodge, leaving a burned-out structure as the focal point of the planned recreational area. Ascutney Outdoors was able to buy the ruined building for $1 from MFW Associates in December 2016 and, with financial support from the regional planning commission and private donors, the group removed the asbestos, demolished the building and planned for construction of the new center, which is expected to be completed in July. Crihfield and Seward don’t hesitate when asked the reasons for the success. The overwhelming success of Ascutney Outdoors’ capital campaign raised $1.1 million and allowed for the development of new recreational opportunities without incurring debt. “We had about 400 individuals donate from the broader community and that included several very generous donations,” Crihfield said. Of the money raised, about two-thirds was used to demolish the old lodge, restore the foundation and build the new center. The remaining funds will go toward the tubing lift and the installation of the new T-bar. The hotel at the resort also has lent its financial support; it recently donated $49,000 to help complete the tubing lift project. “The company has been a supporter of the volunteer group’s efforts to bring back winter activities to the mountain as well as enhance the trails for biking and hiking,” the hotel’s parent company, Orange Lake Resorts, said in a news release last month. The company bought the hotel in 2008. Orange Lake also donated $125,000 toward the capital campaign for the tubing lift and hill, which ends at a large berm near the hotel’s rear entrance area. Several biking and running events are scheduled for the mountain this year and the expectation is that the improvements will spur greater interest in bringing more outdoor enthusiasts to West Windsor. As the transformation takes place on the mountain, the village also is seeing some revitalization happening, with the former Brownsville General Store anticipated to reopen later this summer under new ownership and a new name. Peter Varkonyi and Lauren Stevens are leasing the 3,500-square-foot store from the Friends of the Brownsville General Store, a limited liability company that bought the property earlier this year. The interior has been gutted and renovations are expected to begin soon. The Brownsville Butcher and Pantry will have three sections: a cafe with a coffee counter, a meat cooler and deli cases with an area for whole animal butchering, and a grocery section stocking dry goods, spices, canned goods, produce and more. Outside in the front will be a deck and walk-up window for ordering food and ice cream to go on one side of the entrance. On the other side, there will be a garden space that will sell seasonal plants and area produce in the fall and Christmas trees in December. Varkonyi, who was a chef in South Royalton before he and Stevens moved to West Windsor, said the town’s purchase of the ski property and its plan to actively promote mountain recreation was “without question” a factor in their decision to open the store. 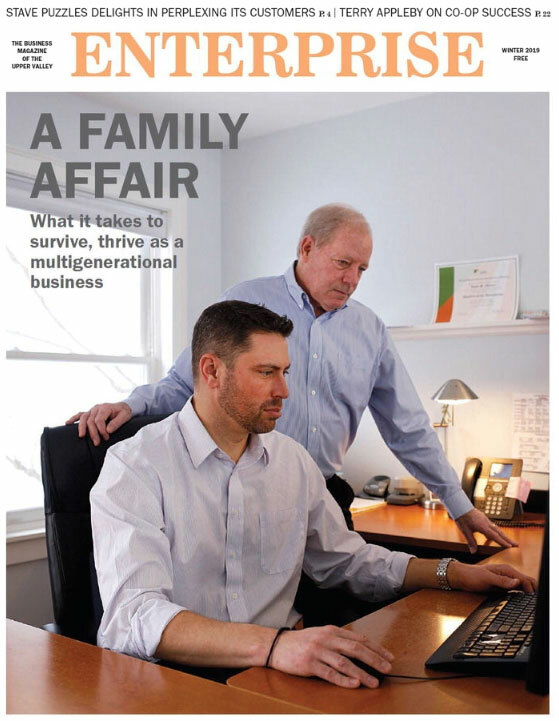 “We at the store said we are the last key component. When the town redid its Town Plan, they anticipated this (store reopening) to occur. The mountain was going to be revitalized by their ownership and the store was kind of the missing link,” he added. The store will employ anywhere from six to eight full-time employees and three to five part-time employees, Varkonyi said. Once the store is established, he foresees partnering with Ascutney Outdoors. “I see this as a symbiotic relationship, including the hotel. When one of us succeeds, we all do. We plan on developing the business first here and then being able to diversify and offer catering, maybe a food kiosk there (at the center). In our growth plan, in the second and third years, our intention is to be able to support new and diversified needs that Ascutney Outdoors has,” he said. Reflecting on the transformation of the last few years and the turn of events that has promised a new beginning and a brighter future for the town, Crihfield said the reason for success is easy to identify. He said the town never got too far ahead of itself, but instead looked at the project in three phases. “One was the acquisition and that was a gutsy move to convince people it could work. 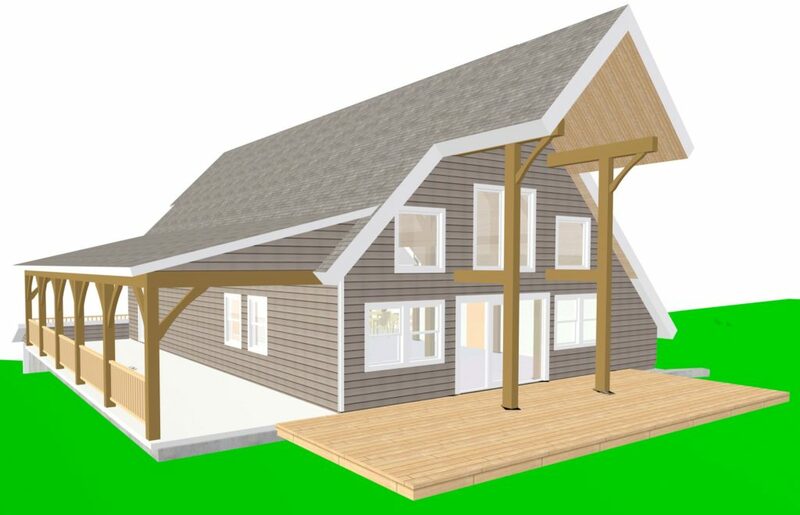 The second is what you see here,” Crihfield said of the ongoing lodge construction and the plans for tubing and skiing. “We are about to embark on the third stage, and that is to run this as sustainable for town residents and the broader area. Do it smart, do it right and have the patience to wait for what is right. I think we have done a really good job of that and now it is about making it work. I think everyone in town is really happy with it,” he said. Patrick O’Grady, of Claremont, is a correspondent for the Valley News, where he covers Claremont and Newport. He can be reached at pogclmt@gmail.com.